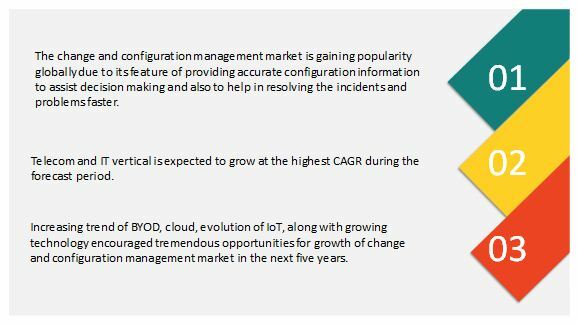 [140 Pages Report] The overall change and configuration market is expected to grow from USD 1.29 billion in 2016 to USD 2.04 billion by 2021, at a CAGR of 11.0% from 2016 to 2021. The benefits of configuration management include establishing a reliable repository of accurate information regarding IT components; understanding relationships between configuration items; and determining what components impact which services. Configuration management solutions aim at providing accurate configuration information to assist decision-making and to help resolve incidents and problems faster, which, in turn, help in the growth of the market. The change and configuration market is expanding as the organizations deploys change and configuration Management solutions to establish effective ground rules which can reduce system downtimes, enhance compliance with guidelines, improve flexibility of the infrastructure and automate this entire process to a certain extent enabling them to concentrate on their core business functions. The base year considered for the study is 2015, and the forecast has been provided for the period between 2016 and 2021. Configuration management refers to maintain consistent state of IT resources throughout the infrastructure. The process involves storage of Configuration Items (CIs), which hold data regarding versions, patches upgrades, system downtimes, documentation, and other in a central repository called Configuration Management Database (CMDB). Storage of CIs in CMDB leads to the creation of a single unified repository for your system related information. This makes it easier for IT administrators to control status of system components, monitor requirement changes at the infrastructural as well as individual level, and ensure system availability by troubleshooting system issues in real time. Establish effective ground rules with which they can reduce system downtimes, enhanced compliance with guidelines, improved flexibility of the infrastructure, and automation of the process to a certain extent enabling them to concentrate on their core business functions are some of the major motivation factor for organizations to use change and configuration management. 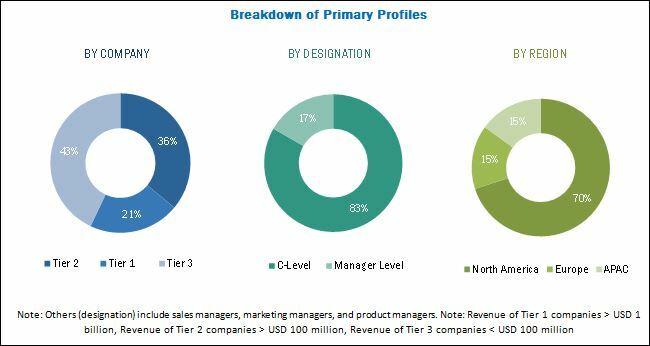 During this research study, major players operating in the change and configuration management market in various regions have been identified, and their offerings, regional presence, and distribution channels have been analyzed through in-depth discussions. Top-down and bottom-up approaches have been used to determine the overall market size. Sizes of the other individual markets have been estimated using the percentage splits obtained through secondary sources such as Hoovers, Bloomberg BusinessWeek, and Factiva, along with primary respondents. The entire procedure includes the study of the annual and financial reports of the top market players and extensive interviews with industry experts such as CEOs, VPs, directors, and marketing executives for key insights (both qualitative and quantitative) pertaining to the market. The figure below shows the breakdown of the primaries on the basis of the company type, designation, and region considered during the research study. The change and configuration management ecosystem comprises of software providers such as IBM (U.S.), Microsoft (U.S.), HP (U.S.), CA Technologies (U.S.), ServiceNow (U.S.), BMC Software (U.S.), AWS (U.S.), Chef Software Inc (U.S.), Ansible (U.S.) and Codenvy (U.S.) among others; solution providers such as Puppet (U.S.); service providers such as IBM (U.S.), HP (U.S.) and AWS (U.S.) among others who offers their software, solution and services to end users to cater to their unique business requirements. In November 2016, Chef has announced to releases chefdk 1.0.3, an enhanced version of chefdk with advanced features. In October 2016, HP Enterprise has launched version 10.30 of configuration management system. This release has linked users to cloud and container environment with real time event based discovery thereby increasing performance and scalability of management system. In September 2016, Codenvy entered into partnership with Bitnami for simplifying the setup and configuration process for development environments in the cloud. This will lead developers to download, install and create a workspace with just one click, and share it with a single URL. In December 2016, AWS expands its business in regions of Canada of North American zone. This expansion will benefit in fast delivery of cloud environment. In September 2015, IBM acquired StrongLoop, a leading provider of application development software provider. This acquisition has helped to extend the enterprise reach using IBM Cloud. Key geographical regions offering lucrative opportunity for the adoption of change and configuration management solution and services? The Change and Configuration Management market is expected to grow from USD 1.21 billion in 2016 to USD 2.04 billion by 2021, at a Compound Annual Growth Rate (CAGR) of 11.0% during the forecast period. Factors like the increasing demand for Agile systems driven by the emergence of digital technologies and possibilities which can be realized by combining the DevOps approach with configuration management tools are driving the Change and Configuration management market. Verticals such as healthcare, banking, defense, Telecom and IT, and many more have boosted the change and configuration management market. 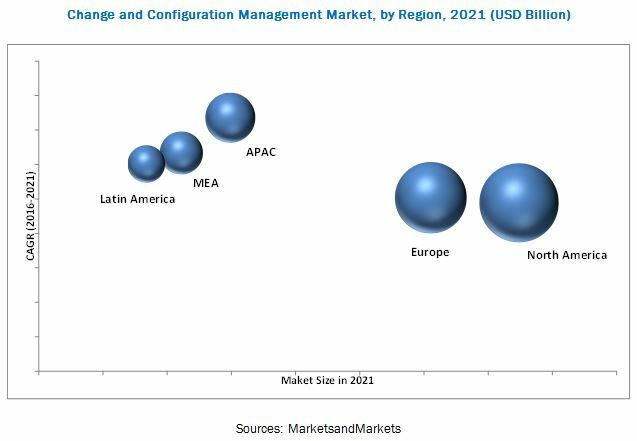 The Change and Configuration Management market is segmented by component, deployment type, organization size, industry verticals and regions. The services market for change and configuration management is expected to grow at the highest CAGR, due to the fact that, more and more organizations are now outsourcing their IT operations to third party vendors. Currently, the rapid increase in initiatives undertaken by organizations to undergo digital transformation is creating a need for change and configuration management practices and tools, as a result cloud based deployment is expected to grow. However, due to reliability and other security issues of the cloud based deployment, the on-premise deployment of change and configuration management expected to hold the largest market share in 2016. There is always a strain on resources for SMEs, in such a scenario the extent of flexibility and automation allowed for by CM tools can be highly beneficial. Effective Change and Configuration Management policies can also be beneficial when partnering with larger organizations, as they might expect such practices to be in place while considering companies to partner with to reduce their overheads. As a result, the SME market for change and configuration management is expected to grow at the highest CAGR in the organization’s segment. The global market has been segmented on the basis of regions into North America, Europe, Asia-Pacific (APAC), Middle East and Africa (MEA) and Latin America to provide a region-specific analysis in the report. North America is expected to have the largest market share and is expected to dominate the market from 2016 to 2021. This is mainly because in the developed economies of the U.S. and Canada, there is a high focus on innovations obtained from research and development and technology. Change and configuration management helps organizations to standardize their IT governance aligned with overall corporate strategy, which further drive the business performance. Both IT as well as telecom industries experience rapid innovations and new technologies on a daily basis. Due to the pace of these innovations, IT infrastructures in both the industries require a high level of scalability and flexibility to be able to incorporate these new applications and solutions. Thus, it becomes a difficult task for organizations in these industries to maintain a balance between staying up-to-date and optimizing their expenditure, this is where change and configuration management practices come into the picture. Banks and other financial institutes are being forced to change their IT strategies with technology penetrating the length and breadth of BFSI as an industry. The emergence of mobility technologies, has given greater power to BFSI institutions to improve the service experience for their customers. The functioning of the industry is sure to change in the longer run with multiple technological trends emerging offering an opportunity for change and configuration management solution and services vendors. E-commerce and analytics has changed the face of retail industry, leading to changes in how customers buy their product. Companies can now track data in real time and influence the customer’s buying decision at any point of the decision-making process due to improved accessibility. Due to globalization, technology more than ever before, impacts and dictates the way the retail industry operates. Change and configuration management enables backward as well as forward compatibilities, reducing operational overheads for the end users of retail industry. Additionally, it leads to the creation of a reliable and flexible infrastructure, which can withstand the rapid pace of technological innovations. What are the upcoming industry adopting changing and configuration management solutions and services? Organization’s structures are rapidly transforming to remain competitive in the global market, leading to change in the traditional business processes. To enable this transformation organizations need to make use of several applications and solutions. This leads to increased complexity in management of configuration due to the diversity of applications in the organization. This is one of the restraints impacting the long term growth of the change and configuration management market. Puppet, Chef and CA Technologies are a few of the key players leading innovation in the Change and Configuration Management market These players have adopted various growth strategies such as new product launches, partnerships, contracts, collaborations, acquisitions, and expansions to expand their global presence and increase their market shares in the global market. The change and configuration management ecosystem comprises the major vendors such as IBM Corporation (U.S.), Microsoft Corporation (U.S.), HP Enterprises (U.S.), CA technologies (U.S.), ServiceNow (U.S.), BMC Software (U.S.), AWS (U.S.), Chef Software (U.S.), Puppet (U.S.), Ansible by Red Hat (U.S.) and Codenvy (U.S.). These players are increasingly undertaking mergers and acquisitions, and product launches to develop and introduce new technologies and products in the market.